This weekend, Beta5 did a Honey Roasted and Plum Sundae for their ice cream social. 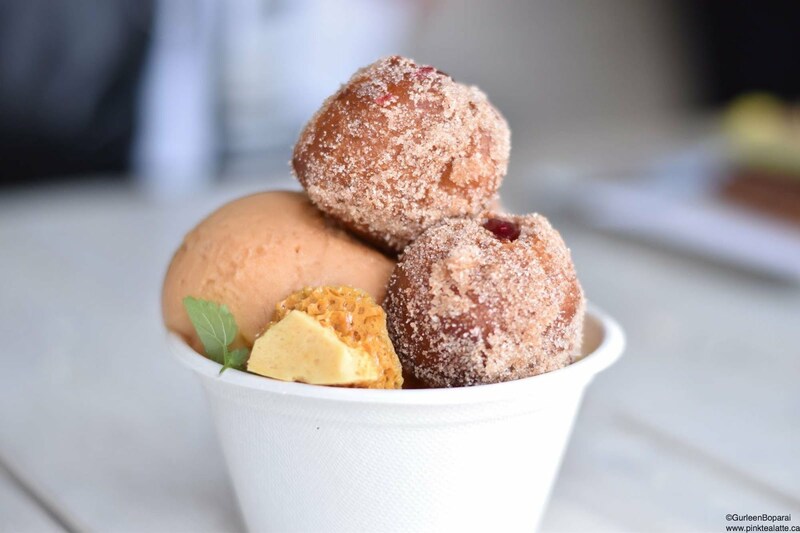 It featured a scoop of burnt honey and vanilla ice cream, a scoop of Santa Rosa plum sorbet, topped with honey roasted shiro plums, elephant heart plum jelly filled doughnut holes, honeycomb crunch pieces and their signature vanilla chantilly! I loved how the Beta 5 team decided to use three different varieties of plum in this sundae to really give it some more diverse flavours. The Santa Rosa plum sorbet was really tangy and quite an intense plum flavour compared to the roasted shiro plums which were very mild. The elephant heart plum jelly was a super bright deep red colour with a tangy sweet flavour. My favourite were the roasted shiro plums because they were so juicy and reminded me of pie haha! The honey comb crunch was YUMMY! The burnt honey and vanilla ice cream was a pleasant light flavour which helped offset the rich Santa Rosa plum sorbet. Especially since the sorbet was really tangy and definitely overpowered the sundae! But because I love refreshing fruity tangy flavours, I could have had another bowl of just that plum sorbet! yummy! Also, holy moly, Beta5 needs to start selling that honey comb crunch because it was marvellous! Crispy, yet light just amazing! 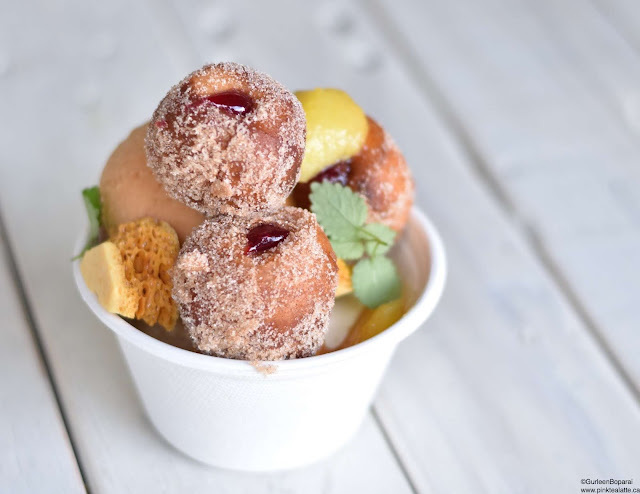 These doughnut holes were definitely a step up from the lemon-curd filled doughnut holes from the blueberry lemon sundae a few weeks back. Alongside the sundae, I gave Beta5's new eclair, Ants on a Log, a try. 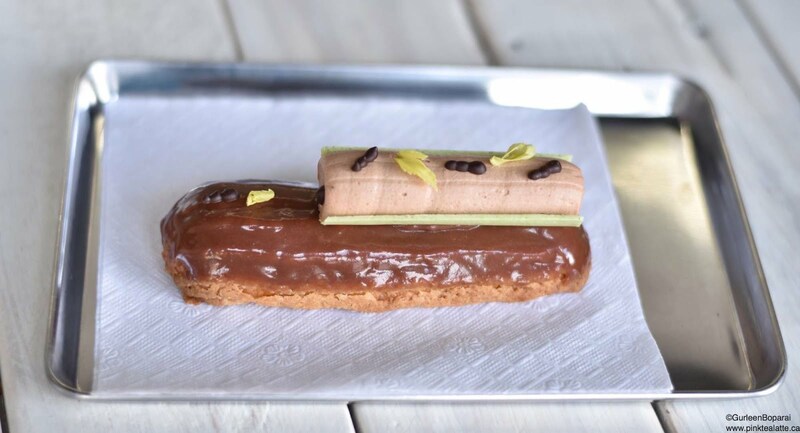 The milk chocolate and peanut glazed eclair was filled with a whipped celery ganache topped with a white chocolate "celery stick," with a piping of whipped milk chocolate and peanut ganache. And of course there were some itty bitty chocolate ants crawling along this eclair log! It was interesting that is for sure! The chocolate peanut butter whipped ganache was yummy, but I am not sure how i feel about the whipped celery ganache. It is just weird! But hey, it is cool that Beta5 tried something bold! I may not like it, but others will probably love it! I hope to try the cherry cola cream puff on m next visit. Another fabulous sundae from Beta5 and I look forward to their next flavour!